Collins Booksellers - Curbside Consultation in Oculoplastics by Robert Kersten & Timothy McCulley, 9781630912406. Buy this book online. 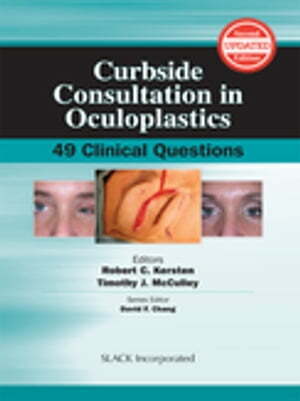 Curbside Consultation in Oculoplastics has been updated into a Second Edition! The Second Edition contains new questions and is completely updated! Curbside Consultation in Oculoplastics: 49 Clinical Questions, Second Edition contains new questions and brief, practical, evidence-based answers to the most frequently asked questions that are posed during a “curbside consultation” between surgical colleagues. Dr. Robert C. Kersten and Dr. Timothy J. McCulley have designed this unique reference in which ocuplastic specialists offer expert advice, preferences, and opinions on tough clinical questions commonly associated with oculoplastics. The unique Q&A format provides quick access to current information related to oculoplastics with the simplicity of a conversation between two colleagues. Images, diagrams, and references are included to enhance the text and to illustrate common clinical dilemmas. Some of the questions that are answered inside the Second Edition include: • What lasers do you prefer for facial resurfacing? • When do you worry that an eyelid growth is malignant? • What are the general treatment guidelines for graves ophthalmopathy? • How do I know when to order and MRI or CT? • What is the best approach to manage trichiasis? Curbside Consultation in Oculoplastics: 49 Clinical Questions, Second Edition provides information basic enough for residents while also incorporating expert pearls that even high-volume ophthalmologists will appreciate. Residents, fellows, and practicing physicians alike will benefit from the user-friendly, casual format and the expert advice contained within.